Yes, that does make a big difference in your vacation experience! New for 2018 - The "Barn" couple's getaway. A private space away from the house to spend some alone time with your special someone! See it in our photos. Included with rental from June 1 - September 30. Please note: Villla Soquel is NOT suitable or available for loud, outdoor, into the night parties. SUN - SUN - SUN - Enjoy its warmth when it's fogged in at the beaches only six miles away. Villa Soquel is located well above the fog line! Modern home on top of the world surrounded by redwoods, oaks, bay, fruit, and maple trees. Red tailed hawks soar overhead, hummingbirds dart about. Song birds sing in the trees. Quail bevies flit across the road and adjacent meadows. Sometimes a wild peacock strolls proudly by! Quiet, peaceful, secluded, but not remote! Only 6 easy miles to the Monterey Bay! One turn off the Old San Jose Road. Then straight up the private driveway to the Villa! You can't get lost coming here. Swimming pool - spa - concrete and wood decks. Lots of sunshine. Shade if you want it. Views! Hiking trails. Picnic on the lawn. Use of kitchen. Very relaxing environment. Do some serious thinking, drawing, writing, dancing, poetry or nothing at all. Just rest! Plenty of on site parking. Will consider an RV up to 25 feet long. Six minutes to Capitola Village's restaurants, shopping, dancing, bars, BEACH and events. Twelve minutes to Downtown Santa Cruz, the Beach Boardwalk and all they offer in that wild west college town! Quieter towns and beaches one half hour to the south like Moss Landing, Seaside and Monterey. Travel North one hour to Half Moon Bay, Atascadero, and Ano Nuevo State park to see the elephant seals or whale watching! Guests love to stay at the Villa Soquel because it is private, peaceful, naturally beautiful but NOT located in the middle of nowhere. I am a city boy from New York. I moved to California in 1976. I've lived in San Diego, Orange County and Santa Cruz. Kathy is from Detroit. She has lived in Napa and Santa Cruz California. We welcomed our first Villa Soquel guests last June (2012) and wow has the Villa become a popular destination! Rest assured that you will feel very welcomed and comfortable should you decide to stay at our charming and relaxing Soquel Villa in the Santa Cruz Mountains! If you are a host in the Santa Cruz area, please feel free to refer to our Villa when your place is booked. Thanks! We have lived in several locations in Santa Cruz county since 1985. Mostly close to the beaches. The Soquel Villa mountain property is by far the best. It's close to town, but when you are outside on the deck, you do not see another home. No traffic, plenty of parking areas. RV's can park here! Private trails to walk off a big meal or to meditate on the property. Soquel is not a big city or town. Mostly restaurants and antique stores here. Short drive to bathing and surfing beaches of Santa Cruz. The trees! The birds! The privacy! The long view down to the Monterey Bay. Above the fog line. We have sun when the beaches are fogged in. The house is beautiful, warm, user friendly and is highly rated. There are three showers and one tub. Should be no waiting even with eight guests! New powerful and quiet heating makes the Villa toasty! All bedding and towels are here for you! WiFi code FREE. Works anywhere inside the house and outdoors. Comfortable and wall of windows allows for a fantastic view. One farm style table off kitchen seats 8. Second round dining / game table in dining room seats 4. Two Televisions. One is 3D, and has XBox connected. Other is 32' and has Wii game connected. Ping Pong! XBox! Electronic drums. Apple TV Audio stations. Speakers inside and outside of Villa. Access to Apple TV. Netflix etc. Your choice of Wii, Playstation or XBox connected to the 60 inch TV in family room. There is a lawn area to lay out. Feel mother earth's life force! Sun and shade on the main wood deck. The pool is shown in the photos. It is NOT heated. Always hot. Kept at 104 degrees F.
The Villa Sequel was really an amazing find and we consider ourselves lucky to have celebrated New Year's Eve with our friends and family in such a comfortable and peaceful place. It's off the beaten track, but close to Santa Cruz and Capitola, with plenty of redwoods. The house is well-decorated with plenty of curios, but still safe for toddlers and babies. The electronic drum kit, keyboard, pingpong table, and chess kept the kids and dads busy while the moms enjoyed wine. The TV and sound system were great, and the office/living room was set up so that some of us got a little work done, as well. I will also mention that the beds were all very clean and new with heaters. There was also a massage chair that was my personal favorite feature. The kitchen was stocked with food and cooking utensils of better quality than any other rental house we've had. I would also be neglectful if I did not mention Daniel, the owner's, personal attention in ensuring our comfort. He lived up to his word in all aspects of the rental transaction. He prides himself on a reputation of quality, and personally checked in with us to make sure everything was well during and after our visit. We were very happy for the opportunity to stay in this remarkable place and would recommend it to anyone looking for a peaceful escape in the hills near the ocean. The location and Villa were beautiful, comfortable and relaxing. This was actually our family's first experience of renting a vacation home. And I'm thankful to say, it was a wonderful experience. Daniel is both kind and personable. From the point of reserving the home to the time of checking out, Daniel was available and responded to any questions we had. The Villa is nestled among several trees. Spending time there provided a sense of being "away from it all"; yet it's a fairly short dive to strores and activities. The Villa was well appointed; everything we needed was provided. The beds and bedding were quality and comfortable. From the board games, ping-pong, hiking trail, pool and hot tub, there was no shortage of things to do. Our family enjoyed our week away and the Villa was a special place to be in order to relax and reconnect. The Villa Soquel is everything the photos show and much more. There is an overall feeling of peace when you enter the property. The owner, Daniel, is the most accommodating property manager we have ever met. No request is too big or too small for him to apply his talents to fixing it. If you are looking for an oasis to rejuvenate yourselves you will find it at the Villa Soquel. This mountain hideaway is the perfect getaway! There is enough room for all parties to socialize and also offers the privacy for anyone to enjoy some time alone. The lovely sounds of the morning birds and the laughter of company made this place something we will not forget any time soon! Thank you for staying with us at our mountainside villa. We are happy that you are pleased with your experience! This house is stunning! Everything we needed was so easy to find, and such an inviting welcome! Couldn’t imagine a better place for our groups weekend getaway! Thank you Arianna! It was our pleasure... come stay at the Villa Soquel again anytime. Drive Highway 17 to Highway 1. Then south on 1 to Soquel. Exit to Bay Avenue, then turn left onto Bay Avenue. No more turns! Go straight up as Porter becomes Old SJ Rd. Five miles up then look for our mailbox on the right. 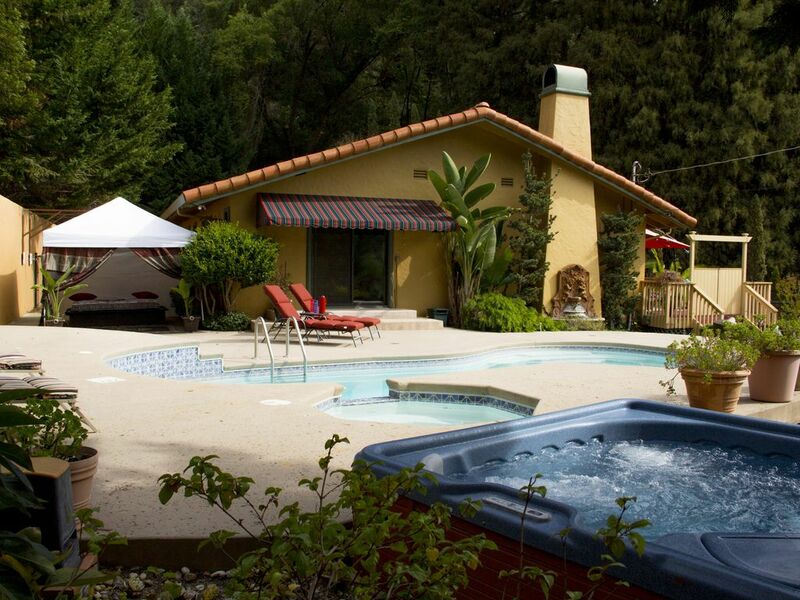 Villa Soquel is located in the Santa Cruz Mountains only 6 miles from the Monterey Bay beaches. An easy and relaxing drive. The Villa's driveway is on Soquel San Jose Rd. The number is on both sides of our mailbox. We have three old redwood stands on the property. We also have a collection of native and non-native trees and foliage on the property. Outdoor quite time is 10 pm every night. If my neighbors report any guest vehicles traveling at more than a S L O W speed on the driveway, or outdoor noise after ten pm, $100 will be deducted from your security deposit.